We awoke this morning to absolutely pouring rain. We were so lucky on this holiday that up to this point we had only had rain for about an hour in Kyoto but the heavens really opened on this day. 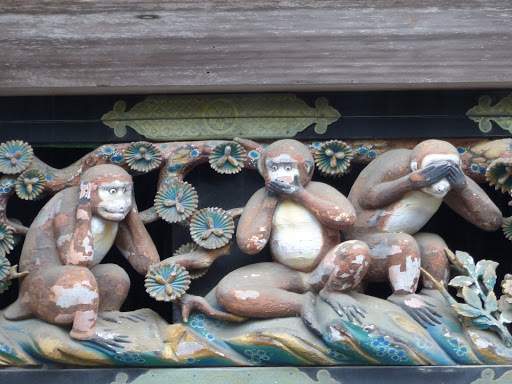 We had planned to visit Nikko, a small town in the mountain north of Tokyo. We knew visiting the town wouldn’t be ideal in the rain but it was our last day of the rail pass and we didn’t want to waste it so we headed off. 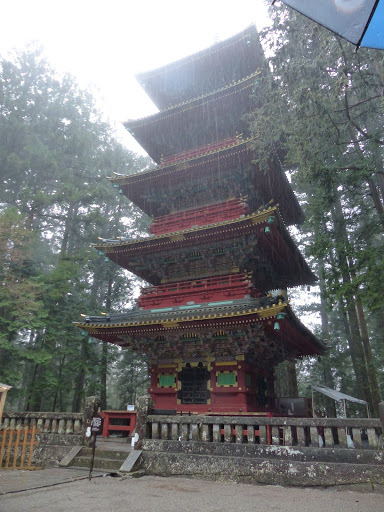 The journey took about two hours and when we arrived in Nikko it was unfortunately still pouring down. We’d been able to get umbrellas from our guest house and had all bought coats, not that it was that cold. From the station we walked over to Shinkyo Bridge. 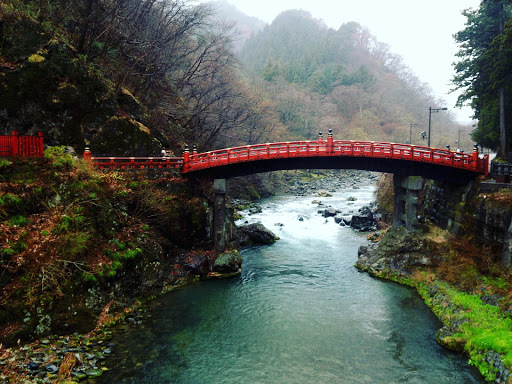 It was a very picturesque bridge that stands by a temple and even in the downpour it was clearly a beautiful bridge. We could have walked across it if we paid the entrance fee to the temple but in the rain it seemed a bit pointless. 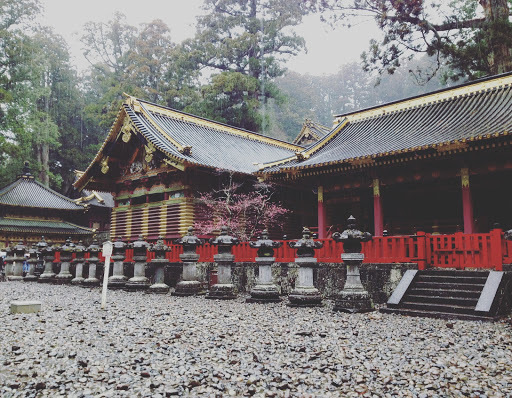 We then walked to Toshogu shrine, the final resting place of the founder of the Tokugawa shogunate that ruled over Japan for over 250 years. 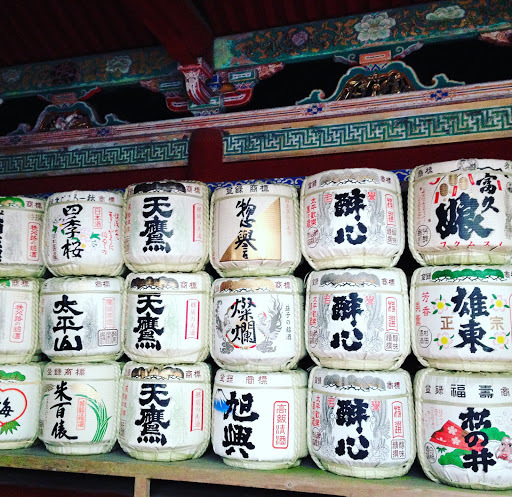 It was a 1300Y entry fee which was a lot higher than any other shrine I’d visited during my trip but this shrine offered so many beautiful buildings. The buildings showed an amazing use of gold leaf and I really loved the huge amount of animal carvings shown on everything, including the famous 3 monkeys. In the rain everything looked quite mystical. 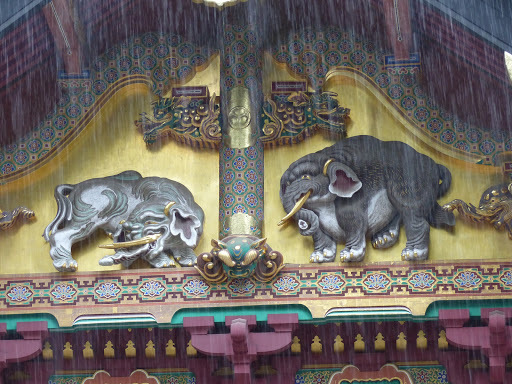 The heavy rain continued the whole way around the temple and by the time we came out we really were soaked through. We had a chat and decided it was time to head back to Tokyo. I had boots which were alright but the boys had trainers and they were absolutely sodden. We dried on the train back, thanks to the lovely heaters they had going. 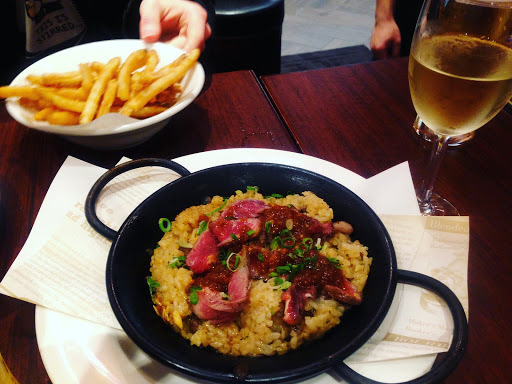 We arrived back at Ueno station pretty hungry and stopped at the Rose & Crown, a ‘victorian’ pub chain. They had some really good priced food, even more so due to the happy hour offers they had on both food and drink. The staff were extremely friendly and despite not being able to speak much English the waiter spoke to us about the Cotswolds and David Beckham haha. I had beef and it was so beautiful. Certainly on my bucket list to go back to Japan and have some proper steak! That evening we retired back to our guest house for shelter and warmth with food we grabbed from the convenience store whilst the rain continued to beat down outside.